It’s 2010. A new year and time for a new class of contenders to challenge for the Mahoning Valley Burger Review Board’s (MVBRB) coveted “Burger of the Year” award. It might be a new year, but our goal is the same — find the best burger in the area. The first burger establishment this year is Top Notch Bar and Grill (Niles). Owner Gary Frederick boasts they “will take home the award at the end of the year.” Is it just hot air, or do they have the beef to back up the boast? Top Notch, located in the Eastwood Mall offers a pleasant alternative to mall food — a great burger and more. A sit down family restaurant with a sports theme, offering burgers for all tastes. The double decker Scrappy was more than enough food for one person with the two burgers, the loaded chili cheese fries and jalapeno peppers; making us think the triple decker would be worthy of a Man vs. Food challenge. The half-pound burgers were complemented with a generous portion of home-cut fries, which are always a plus. So, if you are out shopping, or are anywhere near the Eastwood Mall, make sure to take a trip to Top Notch and get one of their excellent burgers. 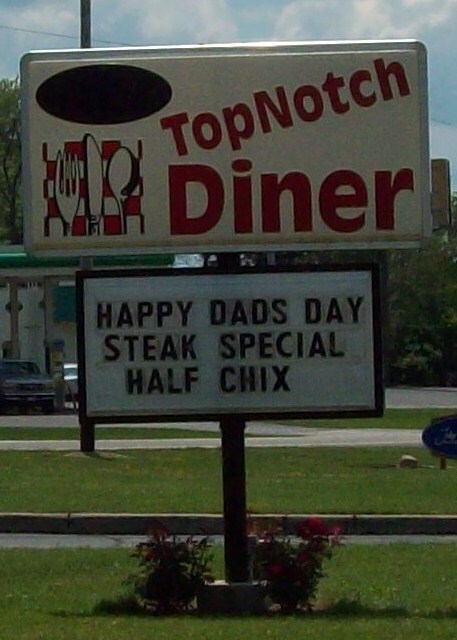 UPDATE: Top Notch Bar & Grille, in Niles, is no longer open, but you can get the same great tasting burger at the Top Notch Diner, at the corner of Elm Road and Route 46, in Cortland! step out of the box, if you dare.